1.2.1 General characteristics of incisions. The incisions in the chalk surface were distinguished by width, depth, the steepness of the sides of the trough and the form of the bottom. All strokes that make up the letters in the inscription share some similarities, which would suggest that a similar tool, with a bifurcated tip, was used throughout. A double groove appears in strokes that slope to the right, while strokes that are vertical or slope leftward have a “V”-shaped trough. 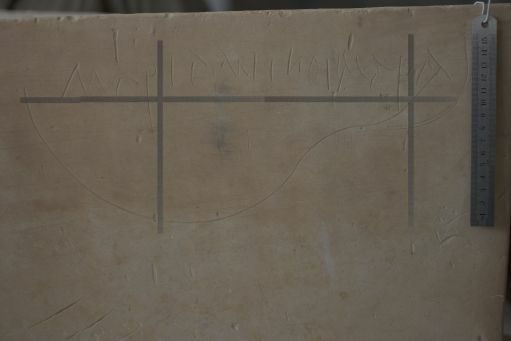 From the discernible angle of execution of the various strokes, it is apparent that both parts of the inscription were made by right-handed writers. However, the similarities end there. 1.2.2 Unique characteristics of incisions. Add to this, the maximum width of the tip from point to point of the bifurcated tip for the second part of the inscription is 1.o mm. The maximum width of the second is approximately .85 mm. Apparently two separate tools were used to inscribe the two parts of the inscription.